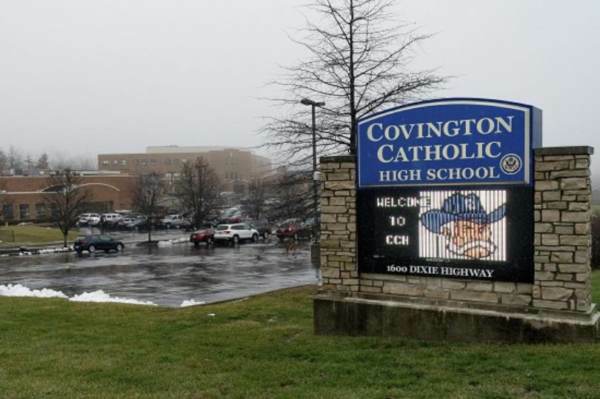 On Wednesday, after incessant and hate-filled attacks, death threats, and hate-speech that has been wrongly directed towards innocent children, the Covington Catholic Bishop, and school Administration have forbidden the students from speaking to the media or defending themselves publicly! There has already been a major outcry against the school for joining in with the Marxist left and threatening to discipline and/or expel the students for behaviors they never committed, but they also refused to apologize and retract those threats, and would only say that they now have a third party investigating the incident. Now, they are effectively silencing them and taking away the boys and their families rights to defend themselves against the racist and hate-filled smears that they endured, and continue to endure by the very people who are supposed to protect them…the school itself! Reports indicate that the Administration and diocese were not happy that the students were talking publicly about what happened, citing that the school was concerned for their safety. “They’ve already been victimized by the media, now they are being victimized again”, as she pointed out that the school and Bishop refused to apologize to the kids. Now once again, they are victimizing the kids yet a third time, as they threaten the kids not to speak out and defend themselves in the court of public opinion! Also, attorneys for the Covington teen students announced on Fox News that they are also giving Hollywood celebrities and the Mainstream Media 48 hours to retract the malicious and false statements about the teens, as well as apologize. Otherwise, the attorneys said they will be forced to move forward with lawsuits against any and all parties necessary! Ultimately, it is high time that the Marxist infiltrated left-wing Hollywood, Mainstream Media and Progressive Democrats reign in their racism, hate-speech, and Fascist idealism! Unfortunately, it is likely that they will continue to project their hate, their anti-Semitism, their racism, and their disgust with our nations Constitution and the power that it wields to ‘We the People’. Fortunately, there is now some who are willing to finally willing to investigate, fight, and prosecute the hate, the threats, and the violence! After all, Christian and Conservative silence and passivism have only allowed the hate to burn hotter and brighter until it has now become a raging wildfire that is scarring our nation, and threatens the very fabric our Constitutional Republic.